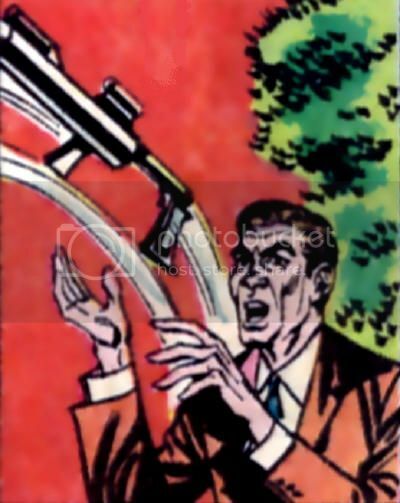 The captive-ray gun was a powerful weapon developed by the scientists of the world-wide criminal syndicate Vulture. According to their leader Mr.V, "It is... capable of overcoming any force on Earth! It's basic component is a microscopic element so rare, it has taken 15 years to extract and refine it for use!" After thousands of tests, the weapon proved capable of projecting an imprisoning sphere around a target of such resilience that even the Martian Manhunter could not break out of it. Mr.V made the gun available to Vulture's members, and it was field tested against the Alien Atlas by Cluzot, but failed to win the day due to human error. J'onn J'onzz destroyed Cluzot's captive-ray gun, but it is uncertain whether it was the only working model. 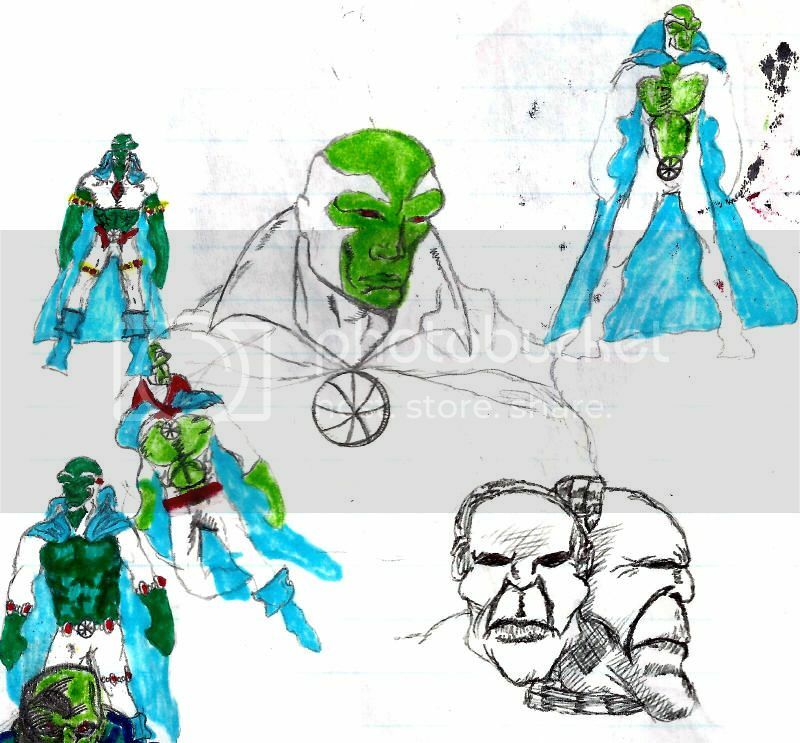 I've spent a lot of years doodling out crumby alternate Martian Manhunter costumes, and my lack of shame means I'm willing to share them with the public as filler material. Above is a sampling of suits, most heavily influenced by either Bloodwynd or Pulsar Stargrave. The latter meant uncomfortable means of male skin exposure not seen since the first Chippendales disco night in 1979. I don't think the J'Onn J'Onzz head sketch sucked, but the bonus Mongul is no prize. #7: Am I blue, Adam Hughes? Powers: Super-strength/speed/senses/durability, x-ray vision, spinning, energy projection and chameleonic shapeshifting. Vulnerable to oil. Bio: The Saturnian Criminal sought refuge on Earth while pursued by lawmen from his world. He battered and stole the identity of Detective John Jones, which he used to set a trap for his pursuers. 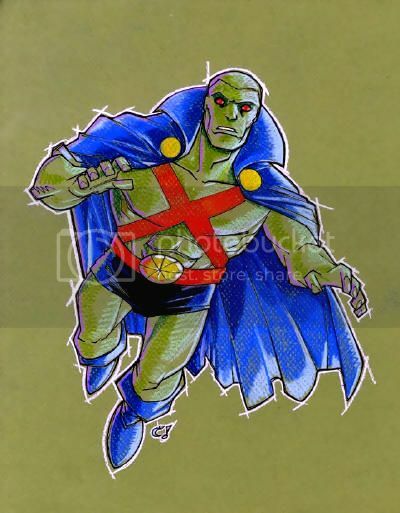 Jones was rescued by his pet Zook, and as J'onn J'onzz, used the Saturnian vulnerability to oil against the criminal. Appearances: 50+ comics, playable character in Justice League Heroes with cameos in two other games. 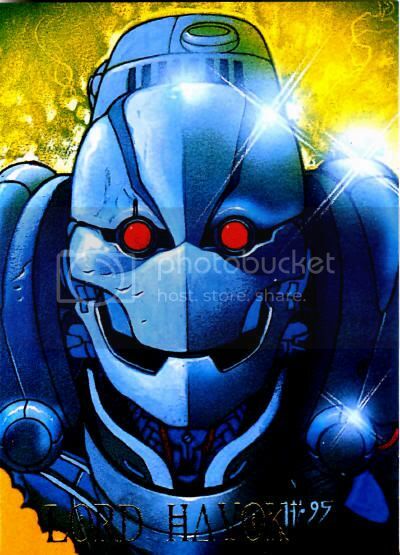 Powers: Genius with an arsenal of specialized weaponry and cybernetic implants. Bio: Prometheus' parents were outlaws gunned down by police when he was a child. A sort of reverse-Batman, Prometheus swore revenge against authority figures, eventually targeting the JLA while under the borrowed identity of Retro. Prometheus fared well against heavy hitters by using devices designed specifically to target their known weaknesses, but was less adept when faced with unfamiliar heroes. Prometheus continued to struggle with setbacks against lesser heroes, but rebuilt his reputation through the murder and mutilation of same before appearing to be executed by Green Arrow. How's this for an unlikely Greco-Roman themed throwdown? On paper, the Saturnian is vastly more powerful than Prometheus, and they're both conniving identity thieves with murderous intent. Prometheus has taken on hordes of angry heroes at once though, and did a real number on Star City, even if its destruction wasn't his primary intent. However, Prometheus is just as easily felled by the deux ex machina he employs against good guys. If Prometheus goes for the commonly known Saturnian weakness to fire instead of the obscure issue with oil the Saturnian Criminal suffers from, he isn't likely to survive the encounter. 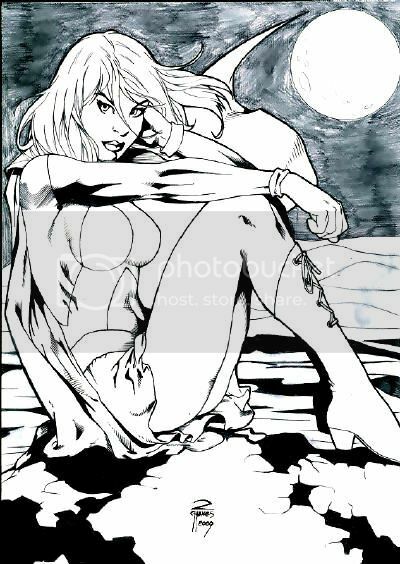 As I've mentioned in past posts, I was psyched at the prospect of getting a George Perez commission, until I read up on the possibility online and learned that the likelihood of pulling a full figure at a convention was pretty close to nil. That's a shame, because I would love to get a complete drawing of Commander Blanx, the original killer of Mars, by an old school master. 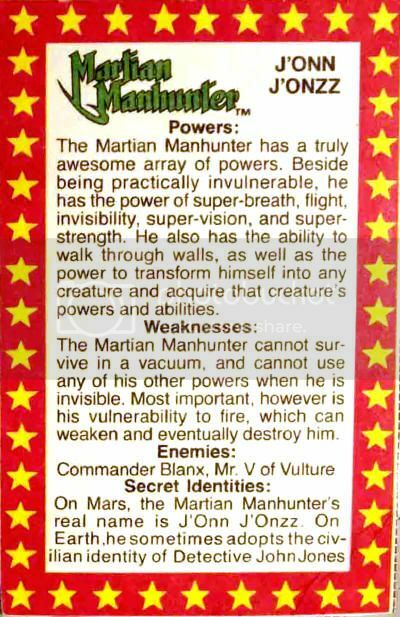 Blanx managed to rate a mention on the biography card for the 1985 Super Powers Collection Martian Manhunter Action Figure, as well as the Alien Atlas' 1986 Who's Who entry, but has never had a listing of his own anywhere (not even those big DK encyclopedias.) I have sad dreams of putting together a period style facsimile page for the ashen annihilator, and having it drawn by one of the Gods of Comics would be the cherry on top. Alas, it was not to be, but maybe Luke McDonnell will come to town someday for authenticity's sake? Moving along, I had heard different things about how Perez allocated pieces, none of which panned out with my experience in Houston. The most likely option was a lottery system, but on Day One, I stood in a line running a couple dozen feet without any sign of tickets or even movement. Guys were bringing whole longboxes for the artist to sign (which I have no patience for,) and I had a long list of commission from other folks I needed to get started on, so I got off. I saw tickets passed around on Day Two, but I arrived late, and the line was more like 100 feet long. I figured I'd have better odds arriving early on the final day, instead. 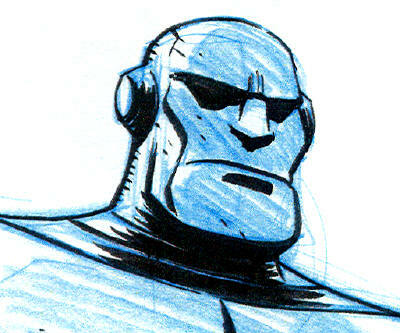 I'd arranged all the other commissions I could, and brought a run of the Nick Spencer T.H.U.N.D.E.R. Agents series I'd pulled from a dollar box, prepared to hunker down and read in line for as long as it took to get me some Pérez. I finally got a ticket after finding out the Comicpalooza system: Each ticket was sequentially numbered, and determined in which order a sketch could be acquired. You could step out of line and do your thing, then return at any time that day. If your number was the lowest present, you moved immediately to the front of the line. However, the ticket was only good for one day, so guys who tried to collect from a previous day's ticket were admonished and had to collect an entirely new ticket. Every person who followed the rules got a sketch for a reasonable price, about $40 with some variances. The line was moving fast enough that day that I gave up on reading after 1¼ comics. Instead, I chatted with fellow fans, including a guy whose daughter was dressed as Robin, and had received a sketch on her cape from Perez. 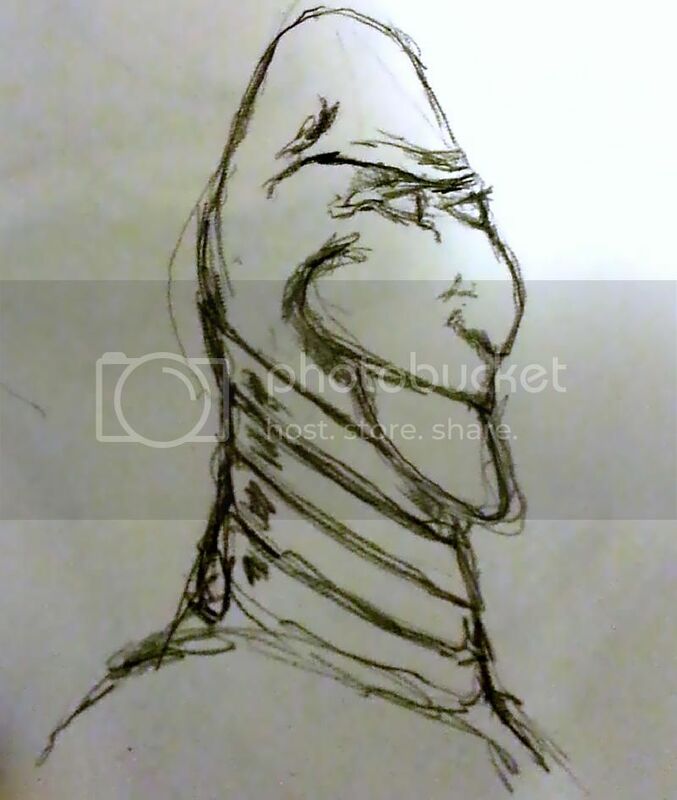 When it was my turn, I watched the maestro do a minimal pencil outline (contrasted out of the scan) on 9" x 12" sketch board, then produce this bust inside five minutes with a Sharpee. Typically, when I watch a piece done, the artists are closer to how I do things myself-- working and reworking until the drawing suits. Pérez is one of those geniuses you see in YouTube videos who confidently work from abstraction to perfection, his hand never hesitating from start to finish, a crystalline image in his mind transcribed to paper as if by rote. It's appalling how easy he makes it look, but what would you expect from a four color deity? Love the Claudio Castellini vibe. Whatever happened to him? Anyway, check out the original black & white sketch here. Powers: Super strength/speed/stamina, flight, sonic blast, conditional invisibility and other Martian abilities. Bio: B'enn B'urnzz is a criminal from the future who fled justice in the year 2062 by traveling back in time to the present. He then wrecked havoc as part of a crime spree alongside a human gang until he was stopped by J'onn J'onzz and returned home. Bio: Teth-Adam was a champion empowered by the wizard Shazam in ancient Egypt. 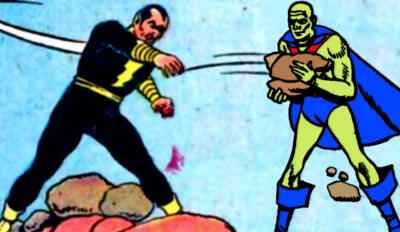 Corrupted by his power, Black Adam was banished to a distant star, and spent thousands of years flying back to Earth. Once there, he battled the Marvel Family, and eventually, much of the rest of the DC Universe. Both B'enn B'urnzz and Black Adam were one shot villains who served as dark mirror images of a hero, but from a different time, and each fought their foes to a standstill before being defeated through a weakness they shared with the hero. B'enn B'urnzz was subdued in a ring of fire, while Black Adam was tricked into saying the magic word that made him human, then rapidly aged to death. The difference is that Black Adam was resurrected a few decades later, kicked around for a few decades more as a Shazam antagonist, and then in the last decade became a bloodthirsty juggernaut in the upper echelons of the DC hierarchy. B'enn B'urnzz has yet to resurface over these past 51 years, and while he performs well in our annual March Madness contests, he's got an awful lot of catching up to do in competing against Black Adam. Check out the original black & white sketch here. The first universe-wide event of The New 52 begins as FOREVER EVIL launches! The Justice League is DEAD! And the villains shall INHERIT the Earth! An epic tale of the world’s greatest super-villains starts here! This issue is also offered as a combo pack edition with a redemption code for a digital download of this issue. What are the odds of Vile Menagerie representation? Good? Bad? Indifferent? I threw this in as a just-in-case, but I doubt there's anything here for the Alien Atlas aficionado. They threw J'onn on the cover and his back-up strip writer is aboard, plus the art should be nice. 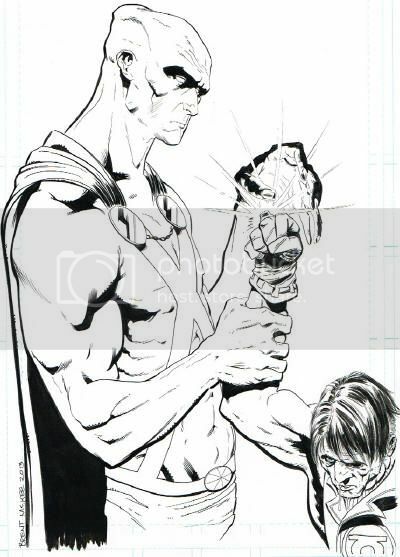 The same background image on this one (though J'Onn is now obscured,) but Kindt is traded out for the writer of Vibe, and I never heard of the artist. 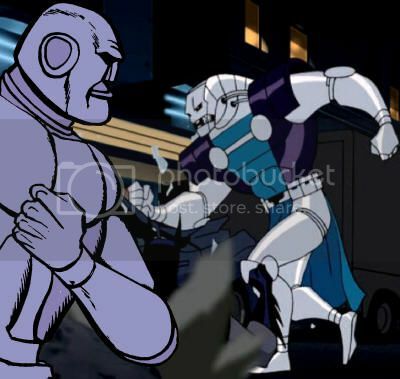 Skeletor is on the loose in the DC Universe! If He-Man and the Masters of the Universe can’t stop him, then how can the Justice League hope to? DC is hiding the cover on this one, as if anybody cares. Giffen inflicted DC/Wildstorm: Dreamwar upon an unsuspecting world, and Soy's the reason I didn't even try Captain Marvel. Let me give you both some NO. Deep in space, an unstoppable force is committing genocide on a galaxy-wide scale, and only the strongest will survive! Be warned, because nothing can prepare you for an all-new Warworld under the absolute rule of the tyrant called Mongul! Every time I start to think I could quit DC, they do something like this. Jim Starlin is one of my all time favorite writer/artists, and while I haven't truly enjoyed his scripts in a long while, there will always be love there. 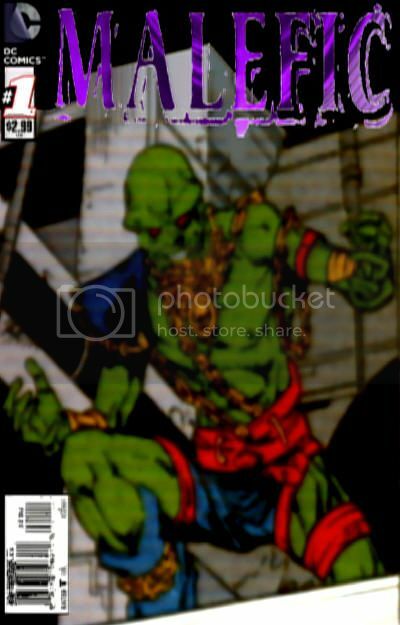 Starlin co-created Mongul for DC Comics Presents #27 (November, 1980), a team-up between Superman and the long dormant Martian Manhunter. Starlin continued contributing to Mongul's adventures as the Man of Steel was joined by Supergirl, The Spectre and Starman in dealing with Mongul's machinations. 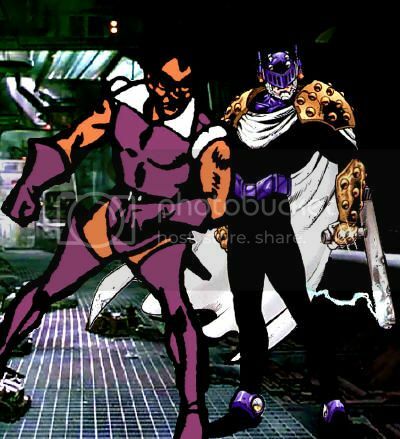 Other creators took to Mongul, most memorably Alan Moore, but the character drifted far from his original conception after the Crisis on Infinite Earths. In recent years, creators seemed to take all their cues from the unimaginative Post-Crisis incarnation of the character, or just mine Moore's one story over and over again. 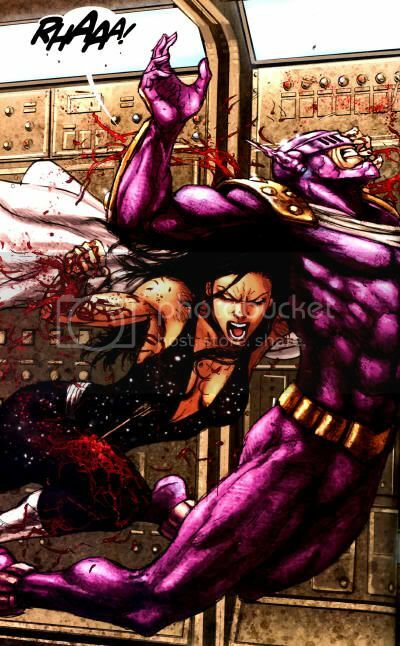 Jim Starlin made Mongul a villainous player with a great deal of potential, which was likely why Alan Moore used the character in the first place, only to see Mongul devolve into a brutal thug. Starlin hasn't written the character in any significant way since 1981, though I obviously and some thoughts about how that could have gone down. 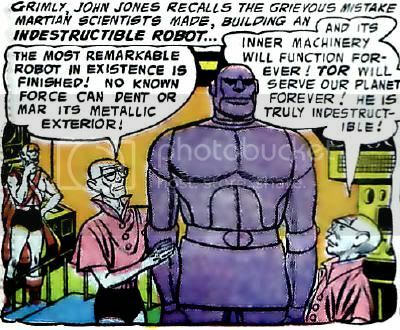 J'Onn J'Onzz was the first super-hero to ever face Mongul, and it would be really sweet if he could get himself snuck into this special. 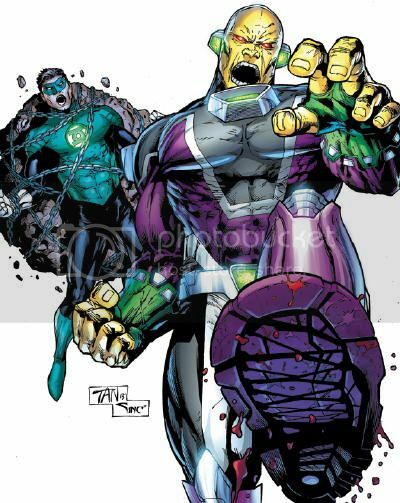 Regardless, even with the Green Lantern connection, the inclusion of Warworld and visual cues in his revised costume strongly point to a return to Mongul's early days. Maybe we'll finally get the full story on The Arkymandryte? 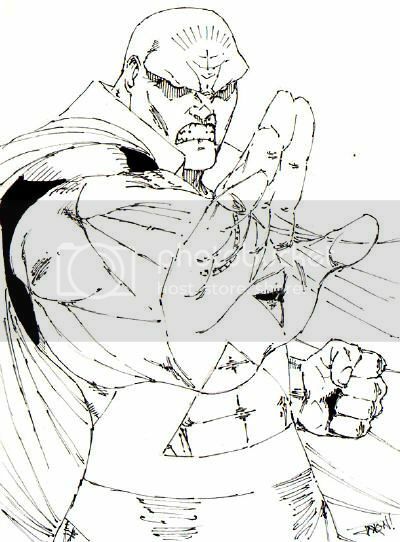 I don't even mind that the artist who killed Mongul in Underworld Unleashed is on board, since he drew the guy quite well before Neron snapped his neck. This book seems all about second chances to get things right, and until Justice League of America #7.2: Commander Blanx gets announced, this is my #1 pick of the event! "Drawn on 2.5x3.5 bristol board with fade resistant markers. 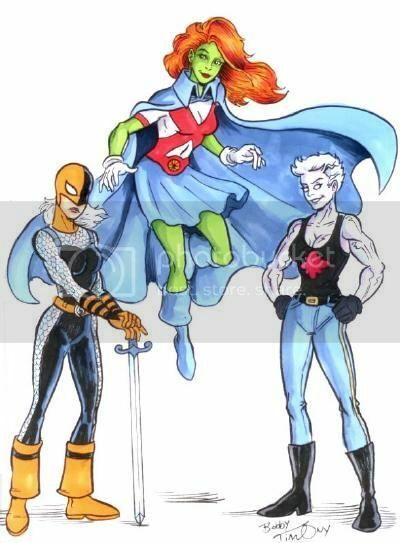 If you like what you see here, and are interested in getting an illustration done by us, be sure to check out our commissions and rates at http://comicartcommissions.com/Fraim.html"
"Ravager, Miss Martian and Bombshell sketch by Bobby Timony from the Albany Comic Convention, November 2012"
"Oh No! Here's a mock MM cover for my redesigns at Comicbooked.com !!! Colured by Lil' Luke Fairhead , Penciled and Inked by me, with a shout out to Diabolu Idol-Head !!!" Dig that rare hopeful image at the dawn of a series! Andy and I are both regular listeners and occasional contributors to the Fire & Water Podcast. He was going to do a whole fanfic reboot for the Alien Atlas, and I even have some work he sent me in progress. The project slipped out of my field of vision, and apparently Kapellusch already published and then lost an internet home for it without my catching on. Obviously, all of those images would be welcome here, but in the meantime here's some pics from "Justice League Underground, which I know nothing about. Powers: Indestructible body, immortality, telepathy, telepathic immunity, superhuman strength/intellect, and ability to possess a host which bestowing its powers onto them. Vulnerable to fire and solar dust. 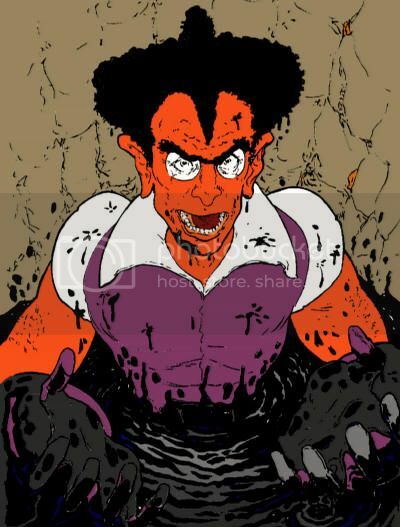 Bio: TOR was created by Martian scientists to be an eternal servant of extraordinary ability, but a programming error instead turned it into an unstoppable force for evil. Unable to effectively destroy the massive robot, Martians led by J'onn J'onzz instead lured TOR into a trap and stranded it on a dead world. 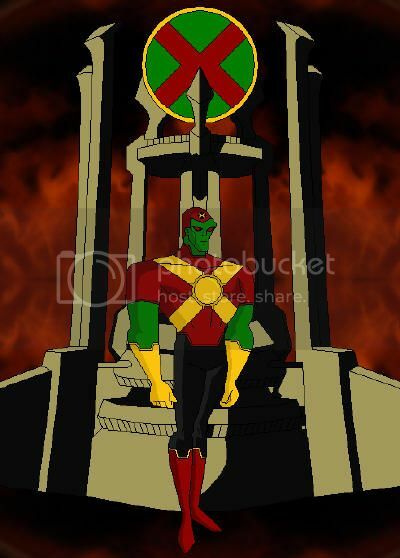 TOR continued to plague the Martian Manhunter through its long range powers until it appeared to perish from environmental factors on its prison planet. Appearances: 25+ comics, live action television, and animation. Powers: Highly weaponized power suit with the usual ill-defined techno-enhancements. Bio: The first Lord Havok was an other-dimensional super-villain whose team managed to kill themselves along with the world they were trying to conquer. He was reproduced through a robot duplicate, along with his fellow Extremists, and fought the JLI on several occasions. A third Lord Havok was formed when the Kilg%re merged with Maxwell Lord. The fourth and most recent version was from yet another dimension, a human born as Alexi Nikolai with severe birth defects. Nikolai's father sought his death as an embarrassment, but his mother loved and protected him until his scientific prowess gave him the means to become Lord Havok and conquer Earth-8. Usually, this would be the other way around. Lord Havok is the Chromium Age villain modeled after Marvel's Doctor Doom but clearly less formidable who is mostly known through appearances in Justice League comics, but somehow isn't the one representing the Vile Menagerie today. 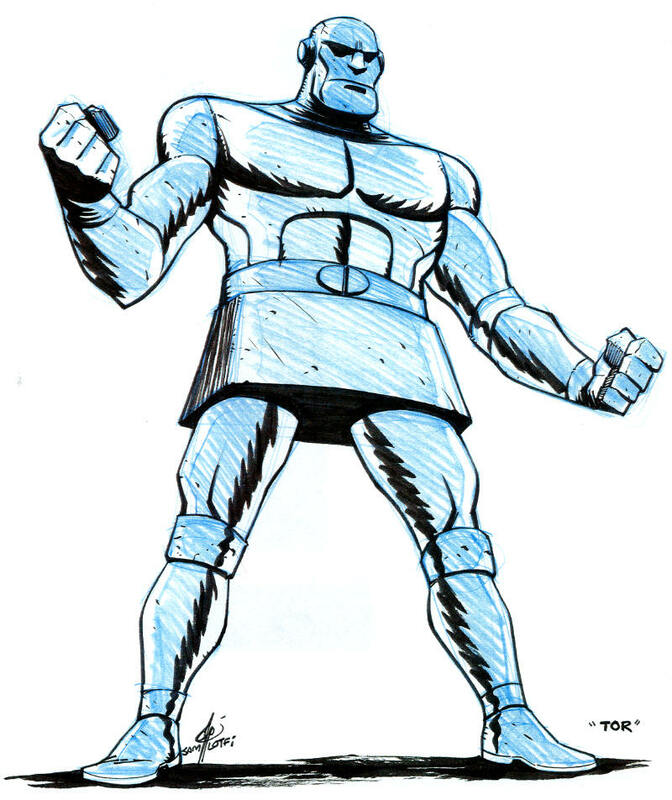 Instead, TOR is the early Silver Age creation whose remarkable powers should easily triumph in this match. As a unit, the Extremists earned a rep for being severely dangerous thanks to slapping around Justice League Europe during its heavily muscled Bart Sears heyday in a story running parallel to Despero's high water mark against Adam Hughes' JLI. Unfortunately, the Extremists were hurt by their initial twist ending and some seriously half-assed revivals until they spent all the credibility a bunch of blatant analogues could muster. Lord Havok was sort of the face of the team, which led to him being repurposed as part of Max Lord's '90s heel turn, but nothing much ever came of that. The pre-Flashpoint version is probably the best and most dangerous of the bunch, in part because Liam Sharpe basically turned him into Death's Head II, but I still don't see him being enough to topple TOR. 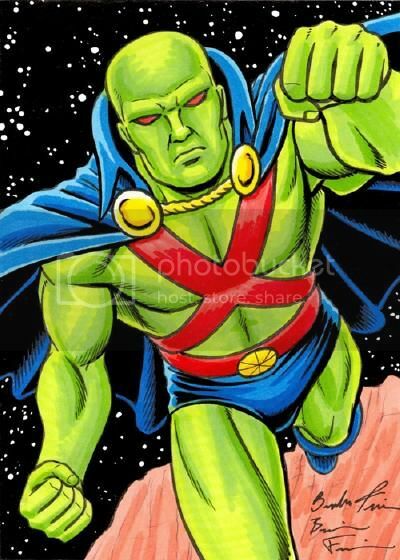 Roh' Kar was a Martian Lawman, who came to Earth 10 years before J'Onn, the Martian Manhunter had. Roh' Kar was sent to Earth to capture an escape criminal. During his mission Roh' Kar discovered that he liked Earth, so once he returned the criminal to Mars Roh' Kar returned to Earth and led a life of globetrotting, along his travels he met a young Bruce Wayne, who was still training to become Batman. Roh' Kar came out of hiding when he heard the mental cry from the Martians being held. 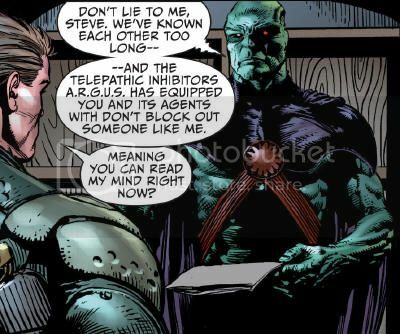 The name variation and "mental cry" would be related to the events in Martian Manhunter #1 (October, 2006). It's funny seeing the guy so beefy. "Another fine canson paper piece by good friend Craig Rousseau"
It's finally time to start the 2013 commissions! Yay! And we'll start with 余依笛! What, you don't read Chinese? Okay, we'll start with Yidi Yu! Yeah, I don't know who that is, either. Oh wait, it's the artist known more commonly as Kiriska? Of 2012's Human Squirrel figural sketch and Human Falcon bust? Say, we like her! I still want to get a full color full figure from her someday, but until I get my crap together and set up a commission by mail, it doesn't seem likely to happen. Kiriska read the posts linked above, and I pitched her on the idea again, but yeah, we ended up with another 4" x 6" head shot instead. Maybe I'll just have her do individual body parts until I build the commission into a figure. It would help if I'd gotten three of Kiriska's classy and inexpensive pieces like I'd intended, but Comicpalooza 2013 was frankly a hassle for me, and I didn't have the oomph to pursue it like I should have. It's a shame, since Kiriska turned in a fine piece on the very first day. Ben Stoves is pretty smug looking for a guy in a Squirrel costume, huh? I wonder how he'd fare against that guy I saw cosplaying as Frank from Donnie Darko? I like the exposed eyebrow, recalling how Jim Lee and Rik Levins used to do Captain America in the '90s. The suit may be cute, but mind that claw, kid. The colors work great here, and Kiriska even started putting her pieces in a little resealable bag with a custom cut backing board. Nifty! For more, visit Kiriska.com, the tumblr A Question of Intent, &/or her deviantART gallery! The first regular issue of The Uncanny X-Men I bought was #168 in 1983. I read it sporadically for several years, then started collecting it monthly with #209 in 1986. This decision caused me to begin buying more and more "mutant" titles, which defined my reading habits for years. Longtime writer Chris Claremont was the constant in terms of quality throughout that time, and when he was driven off the books in 1991, I started having doubts. I stuck around until Uncanny X-Men #304 in 1993, using the crossover "Fatal Attractions" as my jumping off point from the entire line. Some of the X-Books were better than others, but I found that I no longer had a passion for that "family" of titles, which had successfully segregated themselves from the greater Marvel Universe for the duration of my following. I've read individual Marvel Comics since then, but in terms of supporting their universe as a whole, well, I've been a fan of their movies, at least. Meanwhile, I bought The New Titans #78 in 1991, and fell hard for the revitalization of the title longtime writer Marv Wolfman had found with Tom Grummett, Al Vey and Jonathan Peterson. My interest flagged with the drop in quality that came when all but one of those talents left what became a whole other family of titles. One was canceled following the Zero Hour crossover event, and I dropped the other two a few months later. Luckily for DC, events like Reign of the Supermen and Knightfall had begun to draw me into the greater DC Universe. One of the reasons I dropped those Titans titles was because I bought every DC Comic published in October 1994 as part of the first "Zero Month" promotion, and kept up with several as a direct result. Hell, finally finding a welcoming entry point to Legion of Super-Heroes continuity kept me on the hook for two titles across nearly six years. That alone should have made the effort worthwhile for DC, who haven't managed to keep any single volume of Legion going for six consecutive years since then, with six attempted ongoing series in thirteen years. Here's the thing-- I've been in pretty much the same place with DC as I was with Marvel in 1993, but I've stayed there for the entirety of the new millennium. I got down to just buying R.E.B.E.L.S. at one point, thanks in part to Martian Manhunter getting himself dead, but I've found that it's a lot harder to decouple from an entire universe than it was from a single branch. I wasn't a Titans fan or a Legion fan, but instead I was invested in the entire universe. However, decisions made by DC over time have helped me to kick the habit. My appreciation for the greater DC universe caused me to dislike Superman and Batman even before 1999 because of my resentment at their constant elevation above all other heroes, even (especially?) Wonder Woman. I can't count how many Leaguers have been murdered, raped, or suffered other indignities that render them unusable. The arrival of a new generation of Teen Titans from out of Young Justice members I wasn't into displaced the former members from my heart, and DC's attempts to resettle the old membership in books like Outsiders and Justice League of America failed to win me over. I had hopes for the post-Final Crisis de-boot of Legion continuity back to their '80s glory days, but that was almost immediately polluted, and the property is now as toxic as it ever was. The Green Lantern titles are headlined by a mass murdering idiot I can't stand. I like Supergirl, but I was a fan of Linda Danvers, not Kara Zor-El. Same goes for Connor Hawke. I miss all those characters I embraced as the new deal in the '80s and '90s but have since been discarded for their "classic," retrograde, whitebread predecessors. Let me tell you, my love for Wonder Woman rivals anyone else in comics, including the Martian Manhunter. I have a blog dedicated to her, but I prioritize J'Onn J'Onzz because the Amazing Amazon has tons of other fans supporting her and overseeing the production of glorious tomes like The Essential Wonder Woman Encyclopedia. I sometimes feel like I've taken the black to guard the Wall between the Alien Atlas and a vast, hostile wilderness awaiting heroes DC deems no longer worthy of maintaining anymore. Alas, poor Zook. Anyhow, my point is that I bought virtually any comic book that featured Wonder Woman for over a dozen years, but the current regime finally managed to shake me loose in 2007, just a few months before I started this blog. I've read much of what's come since, but as trade paperbacks that I often borrowed free from the library. I never thought anything could stop me reading about her entirely, and then Brian Azzarello happened. ...except J'Onn J'Onzz. 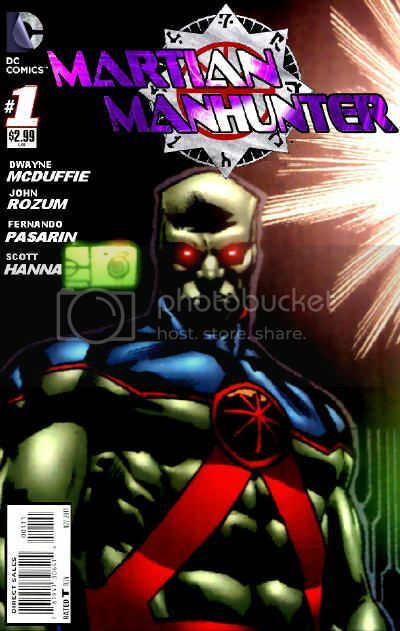 Despite how lousy Stormwatch ended up being, it didn't euthanize the Alien Atlas right out of the gate, and teases in books like Justice League let readers know the Manhunter from Mars still mattered in the greater scheme of the New 52. While I haven't been bowled over by his role in the relaunched Justice League of America, it hasn't been bad either, and his rising profile in the coming months will surely draw my continued attention. Since I was already doing the one title, and I still thought the Secret Society of Super-Villains was a nifty idea, I even picked up satellite issues of titles like Savage Hawkman and Catwoman. If the early issues of JLofA hadn't at least sustained that interest, I wouldn't have decided to preorder all the core "Trinity War" titles, and some of its satellites. 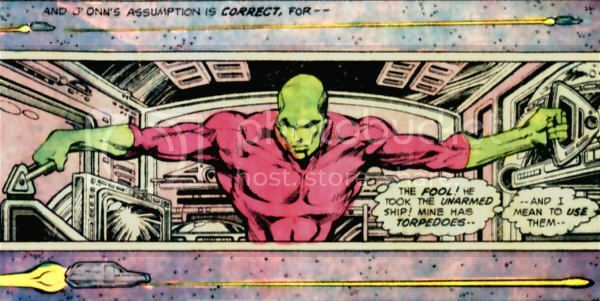 Geoff Johns and Matt Kindt have teased a familiarity with Martian Manhunter lore none of his solo series have had since-- jeez, potentially ever. The one thing keeping me around is this last hope that someone will finally get the Sleuth from Outer Space "right." 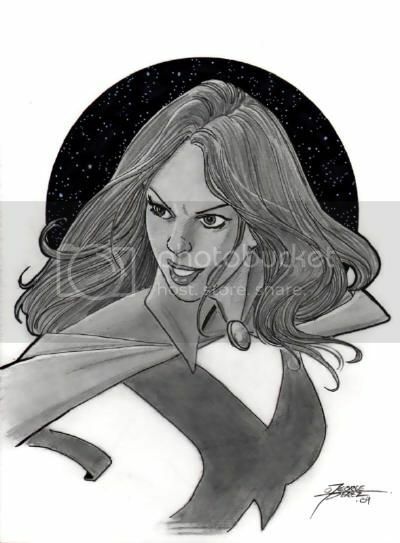 "This 2009 Miss Martian headshot was drawn by George Perez. I purchased it from the original owner." I got a George Perez head sketch and a Miss Martian commission at Comicpalooza this year. I can't compete with this though. Cue envy. No green jokes in the comments, please. 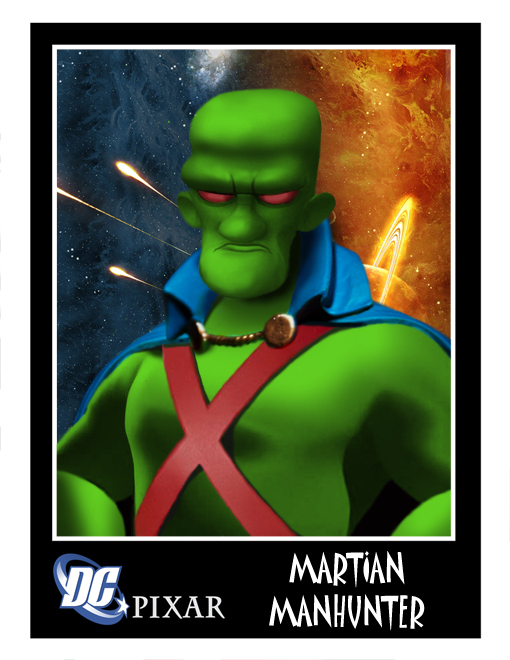 It's been a long while since I covered Ross' many make believe team-ups between J'Onn J'Onzz and other super-heroes, so you might want to take a gander at The Brave and the Bold: Batman and The Martian Manhunter or "Super-Team Family: Martian Manhunter and Beta Ray Bill". That last one was my favorite of the three, since the two Walt Simonson images laid rather seamlessly together, but I do love how well Art Adams' Ben Grimm mingled into one of my favorite Jim Starlin Alien Atlas covers. In case you missed it, the Sleuth from Outer Space actually did tangle with the Ever-Lovin' Blue-Eyed Thing in DC versus Marvel for all of one panel back in the '90s. 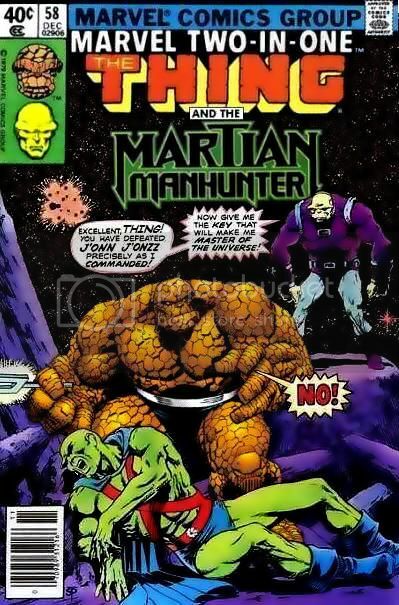 I tend to think the Martian Marvel would be the one to ultimately come out on top, regardless of what this "cover" depicts. Appearances: One comic story each. Powers: Both the Human Falcon and Mr. Moth flew armed specialty aircraft equipped with grappling cranes. Mr. Moth carried a ray-gun pistol, while the Human Falcon had a wand that could project concealing feathers. The Human Squirrel was an excellent acrobat. Bio: The Human Falcon committed bird-themed heists that often intentionally imperiled innocents as a distraction ploy. Mister Moth used similar high tech gadgets for his light-themed thefts, and while less prone to directly hurting people, was more obviously mentally tweaked. 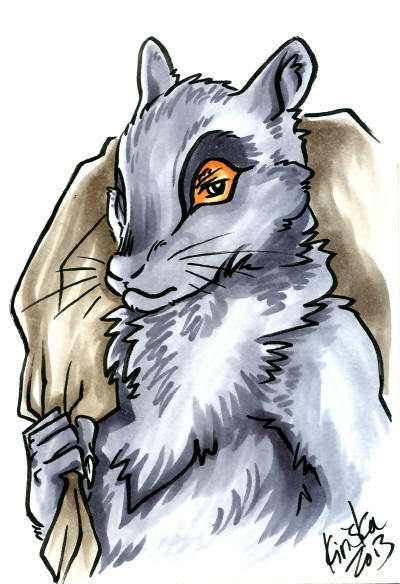 The Human Squirrel was ironically a cat burglar until he decided to go straight and join Detective John Jones' Ex-Convicts Club. Appearances: More than a dozen comics and numerous animated series. Powers: The Terrible Trio's devices included burrowing, missile, “eel,” “pilot fish” and “swordfish” machines. Bio: The Terrible Trio were genius inventors who each specialized in crimes related to land, sea or air. 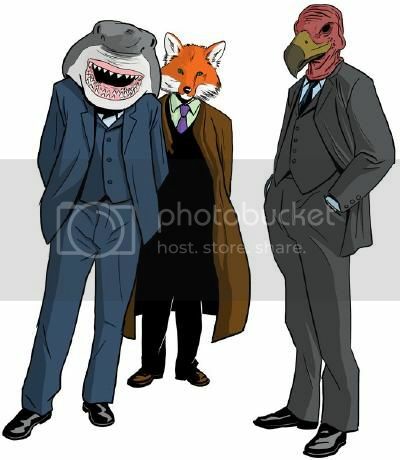 They decided to pool their intellectual resources to strike on all fronts with elaborate machines while wearing animal masks that represented their individual specialties. 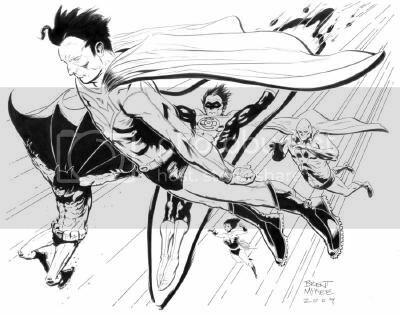 They were typically thwarted by Batman and Robin, though they were also instrumental in the origin of the last Pre-Flashpoint Doctor Mid-Nite, who once threw a wrench in their works. Given how often the Terrible Trio are brought up in conversations about Batman's extended rogues gallery, I was surprised to find that they've had relatively few comic book appearances. They're obviously better loved by animators, who've put them in The Batman cartoon, Batman: The Animated Series, and unsurprisingly Batman: The Brave and the Bold. That said, it took all three of these guys to stymie the Dynamic Duo. 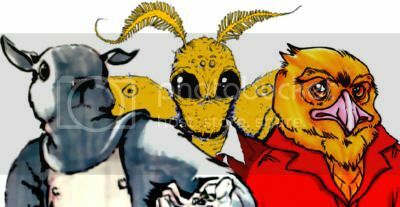 The Human Falcon, Human Squirrel and Mister Moth have never worked as a team, and only have one appearance a piece. However, each of their stories involved their holding off the Martian Manhunter on their own (henchmen exempted, especially since the Trio had some, too.) I recognize that fan polls should have limited sway, but when I've pitted Moth & Squirrel against other members of the Alien Atlas rogues gallery, they've done exceptionally well in the voting. 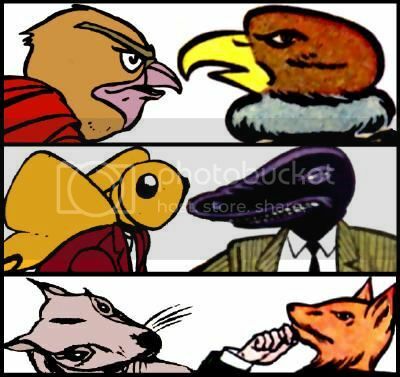 I doubt Fox, Shark and Vulture would fare as well against Maxie Zeus, Rat Catcher, or Anarky in solo combat, and those guys are C-list at best. This is a matter of levels, and despite their lack of mainstream recognition, the "Human League" of the Vile Menagerie are simply operating on a higher (and weirder) plane. Okay, here's the deal, in case you don't keep up with comic book news. For the second anniversary of DC Comics' New 52 relaunch, all of the titles in that category of the line will halt whole numbering for the month of September. Some titles will skip publishing that month entirely, and the rest will put out comics with decimal points added to the previous numbering as “Villain’s Month” sees those books hijacked by bad guys. For instance, most of the Batman titles will be getting several decimal point issues, like Detective Comics publishing four weekly books numbered 23.1-23.4, each with a different spotlight villain. DC axed a bunch of books in August, but if you read remaining low selling books like Katana, don't expect them to get a .1 issue. Instead, popular guys like Aquaman (I seriously just typed that?) will get two, and really popular guys like Batman will get 16+ (seriously.) Also, all the books will jump to $3.99 because they'll each have a 3D lenticular motion cover. What does all this mean for the Sleuth from Outer Space? For starters, the theme month will spin out of the "Trinity War" event, which appears to significantly involve the Secret Society of Super-Villains that has been built up in Justice League of America. The primary creative team for that book, Geoff Johns and David Finch, will move over to a new SSoSV related mini-series, Forever Evil. Meanwhile, Matt Kindt and Doug Mahnke will take over JLofA for a five issue stint. 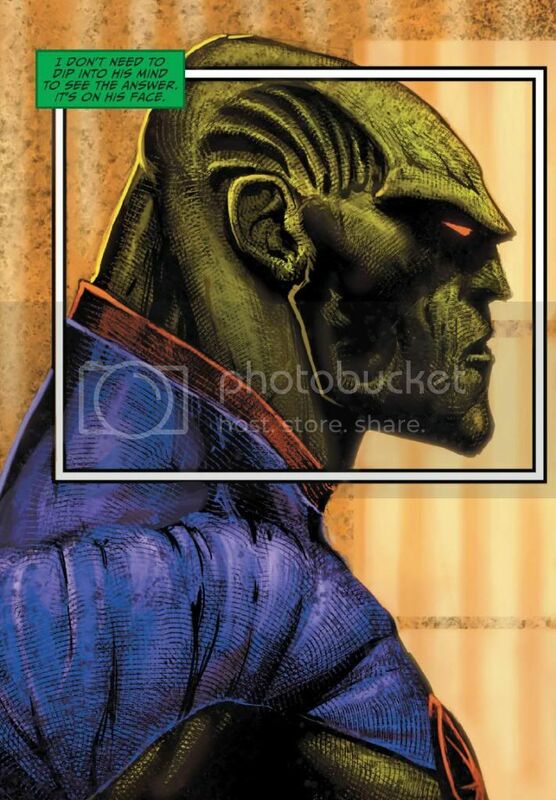 Kindt has been writing the Martian Manhunter back-up stories in the book, while Doug Mahnke has long been associated with J'Onn J'Onzz, dating back to a fan favorite issue of the solo series. 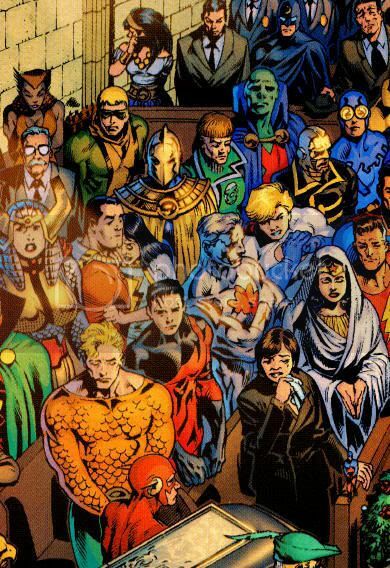 Hopefully Christian Alamy, who inked Mahnke on the Final Crisis: Requiem Martian Manhunter funeral special, will be joining them. Finch's Alien Atlas was alright with some queer, grating flourishes. 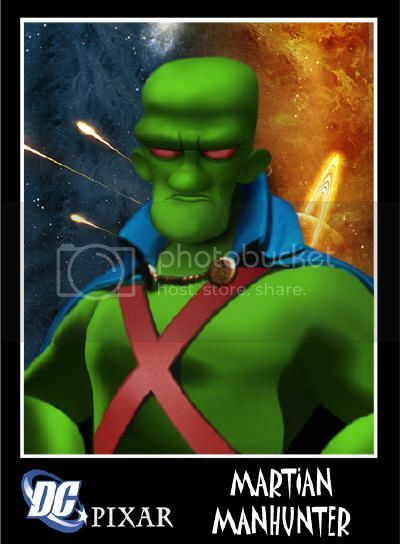 Mahnke has always drawn J'Onn like a boss, and he's even better with Alamy, so that would totally be trading up. 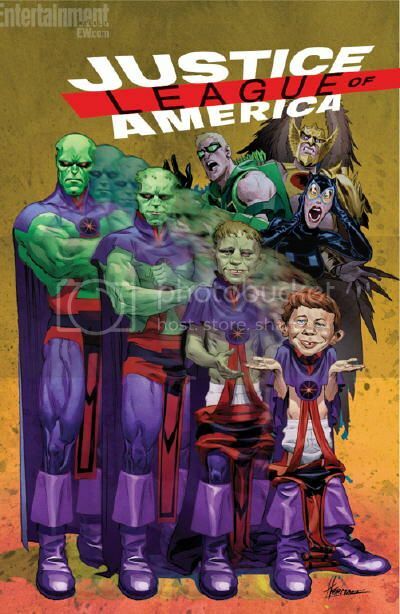 USA Today reports "Kindt will also take over Justice League of America for five issues emphasizing Martian Manhunter, the subject of the writer's recent JLA backups who will be picking up what's left of the Justice League." He'll also write a Forever Evil: A.R.G.U.S. mini-series that spotlights Steve Trevor and their mutual organization. Having caught up on those back-ups and recent Justice League guest appearances, I have to wonder if we're looking at a backdoor pilot for that Alien Atlas ongoing series we've been waiting a couple of years for. 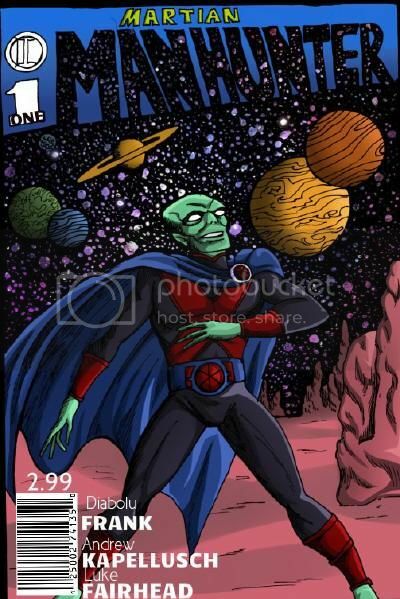 Despero and Martian Manhunters as partners in the extraterrestrial investigation business? The introduction of the New 52 Commander Blanx and/or Ma'alefa'ak? Any of those guys could still get Villain's Month comics, as only Deadshot has a Justice League of America decimal issue, and that's more a stand-in for Suicide Squad. Exploring any of them sets up a need for continuation. Mainly, this was just another way to better know Photoshop and I used the same rules as when I did those "Star Wars" posters. Just collected a lot of images using Google, cut and pasted them together, and this is what you get. I put them in a format that makes them look like those movie & comic trading cards I use to collect as a kid. See all 50(!!!) related images here! 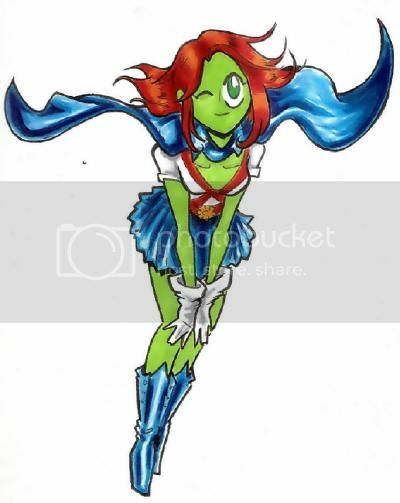 "A adorable Miss Martian piece by the creators of the Underburbs. Bought at NYCC 2010." In 2008, M'gann M'orzz asked "Stop calling me Martian Girlhunter!" Now she's back for more with the same art team! Powers: Presumably possesses all the abilities and weaknesses inherent in the Martian race, but displayed none in print. He instead relied upon his sword, ray pistol, and the use of an armed space shuttle. 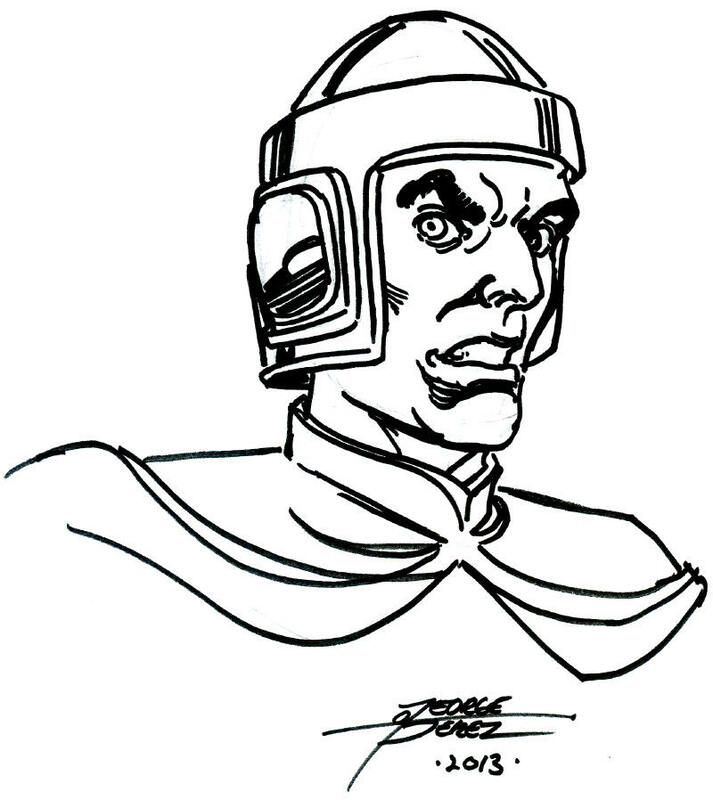 Bio: N'or Cott was the commander of the Martian Army in exile after the destruction of their home world. 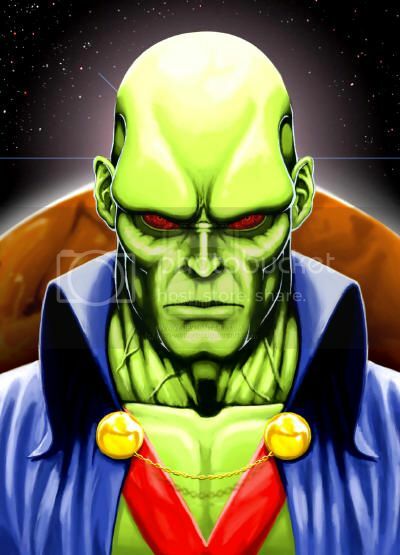 He plotted with R'es Eda to frame J'onn J'onzz for murder to prevent the hero's opposition to a massacre that would allow the surviving Martians to take over an alien city. 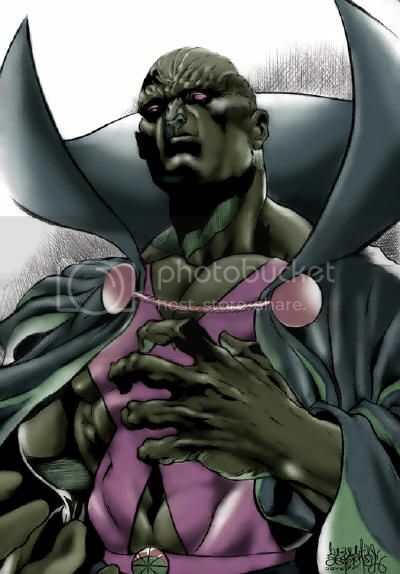 N'or Cott made numerous attempts on the lives of the Martian Manhunter and his fellow heroes before succumbing to exposure from the city's poisonous atmosphere. Nemesis: So many choices. His entire family, for starters. Appearances: 600+ comics, live action television, animation, and video games. 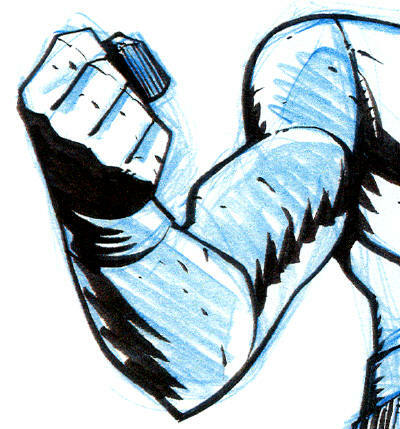 Powers: Superhuman expert combatant with increased strength, speed, reflexes, agility, stamina, and senses. Wilson has a healing factor that increases his lifespan and makes him virtually impossible to kill short of decapitation. He's also very rich and well armed. Bio: Slade Wilson, by his own reckoning, is "a goddam killing machine!" Volunteering for a U.S. Army experiment, Wilson's already exceptional combat prowess was enhanced to an extraordinary level, making him essentially an evil Captain America with greater powers. Wilson used these gifts to amass a considerable fortune as a mercenary. This took a toll on his family, rendering one son mute and another deceased. The Terminator vowed to follow through on his dead son's last assignment, capturing the New Teen Titans for a criminal organization. 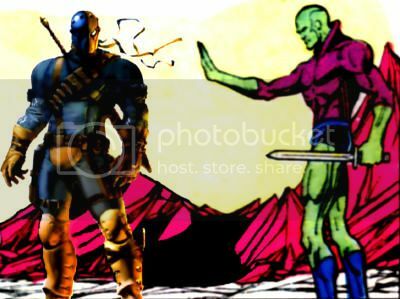 Thus began a path that saw Deathstroke in constant conflict with heroes and villains alike, including seeing his ex-wife, daughter, and surviving son (though Slade did kill the boy once, it didn't take) become enemies sworn to his destruction. If Wilson wasn't so accomplished an adversary, the sheer number of his foes would have overwhelmed him by now.